I'm hot on the trail of Joseph Kirk who lived - and apparently died - in 18th century Berkeley County, Virginia (now West Virginia). Was he the father of my fifth great-grandfather Thomas Kirk (1778-1846)? My ongoing investigation indicates Joseph may be the answer to this longstanding genealogy brick wall. 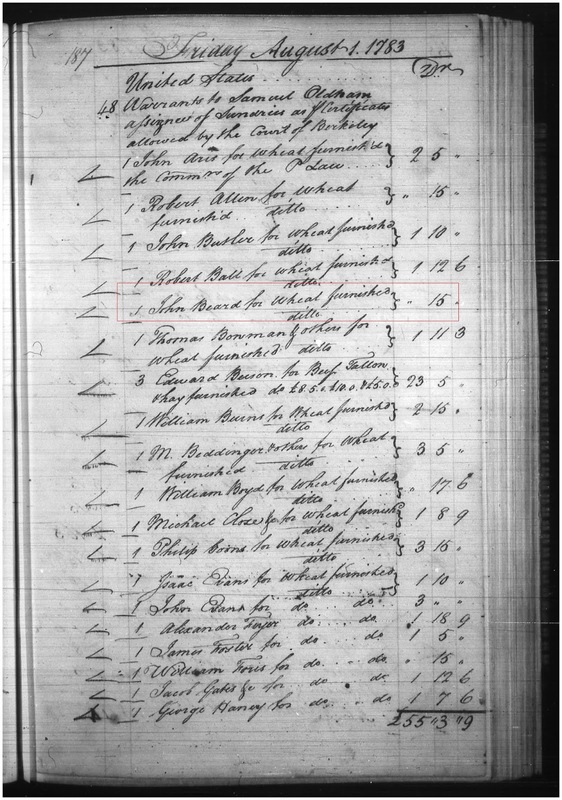 However, until I get access to Berkeley County's probate records (and find an estate settlement for Joseph that names his heirs) it remains an open question. Meanwhile, my exhaustive search into Joseph Kirk turned up Anne Waller Reddy's West Virginia Revolutionary Ancestors. Originally published in 1930, the volume was the first compiled list of Virginians who provided aid to the American Revolutionary forces. Their "services were non-military and ... names, therefore, do not appear in Revolutionary indexes of soldiers and sailors." The names come from Virginia's American Revolutionary War Public Service Claims, which Reddy says recorded services "not only for supplies furnished the army and navy, but also for riding express, transporting prisoners, transporting the sick, transporting provisions, manufacturing firearms." Among Berkeley County's contributors were Joseph Kirk and John Beard (husband to Margaret Kirk, a likely sister to Joseph). Microfilmed copies of the records are held at the Library of Virginia in Richmond. Understandably, I was very intrigued. 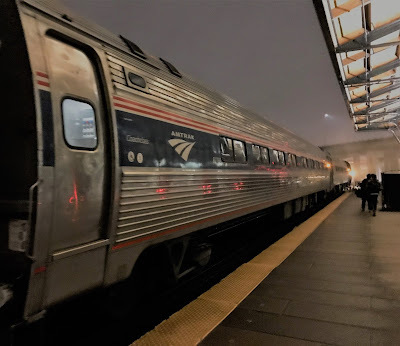 In fact, I was so intrigued that I boarded a train after work and headed south into the driving rain for a genealogy road rail trip! Minor T. Weisiger, a librarian with the Library of Virginia, wrote that beginning in 1780, "the Virginia General Assembly authorized the procurement of supplies from its citizenry for the use of the militia, state, and Continental troops." To undertake this effort, "Commissioners were appointed in each county to impress such supplies and services as were thought necessary to the war effort." Basically, it's a nice way of saying they were forced to provide goods in support of the Revolution's military forces. A certificate was issued to the Virginians who provided supplies, which served as a receipt for the value of the goods rendered. The certificate could then be presented to the state treasury at a later date for reimbursement. 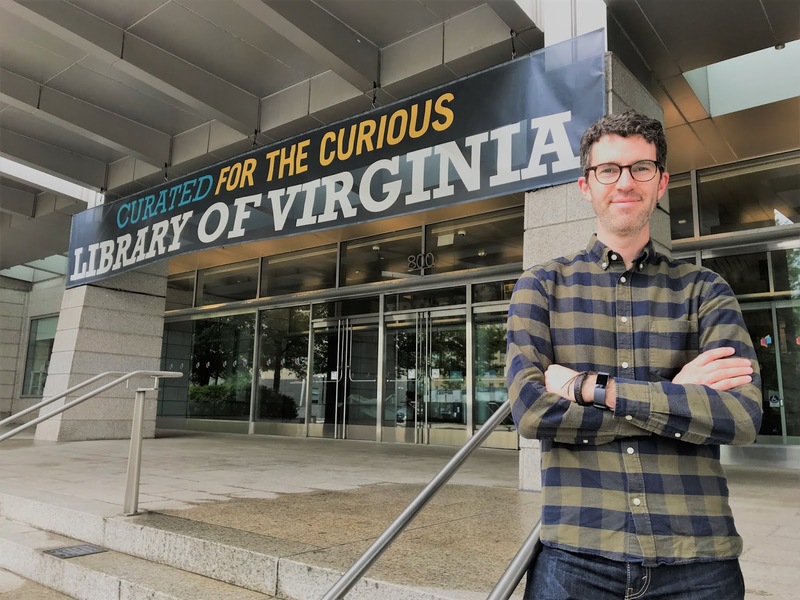 With the help of an archivist (shout out to Amanda! ), I located Joseph Kirk's certificate. [No. 486] Certificate Berkeley County, Virginia. 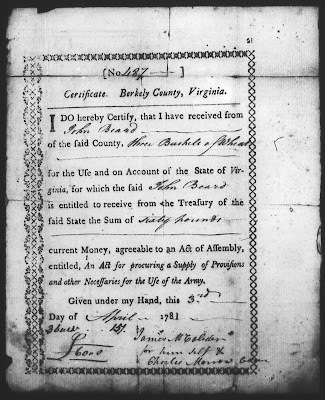 I do hereby Certify, that I have received from Joseph Kirk & Joseph Olive of the said County, six bushels and a half of wheat for the use and on account of the State of Virginia, for which the said Joseph Kirk is entitled to receive from the Treasury of the said State the Sum of one hundred and thirty pounds current money, agreeable to an Act of Assembly, entitled, An Act for procuring a Supply of Provisions and other Necessaries for the use of the Army. Given under my Hand, this 3rd day of April 1781. 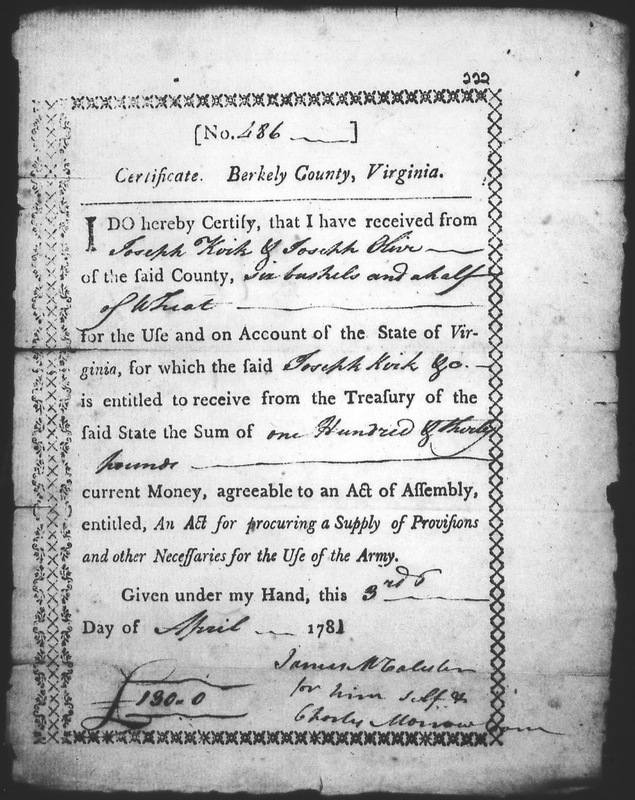 Previously, Joseph Kirk and Joseph Olive were jointly named in a 1773 Berkeley County land lease. The six bushels of wheat must have come from that farm and were valued at 130 pounds. I could find no record that either man ever sought remuneration for the impressed grain. This could be because the reimbursements were carried out in 1783, the year before Joseph Kirk is believed to have died. But why wouldn't his estate or a designated agent seek payment? It remains a mystery. This was also about the time that Sarah Kirk (believed to be Joseph Kirk's widow) appeared in Berkeley County court records on a replevy bond for apparently falling behind in rent payments. The replevy bond and unclaimed Public Service Claim both suggest that Joseph Kirk's family was struggling. 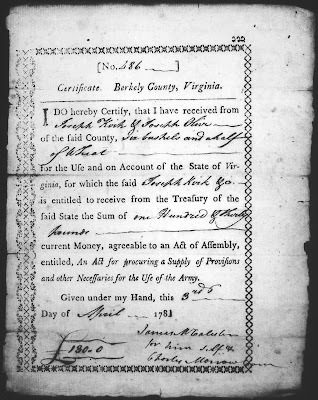 I also pulled the certificate for Joseph's likely brother-in-law John Beard (yes, the same man who appeared on the above-mentioned replevy bond with Sarah Kirk, and then in 1812 sold 100 acres of farmland to my Thomas Kirk in Licking County, Ohio). While the records are microfilmed in alphabetical order by surname, I was immediately struck by the number noted on John Beard's certificate. John's certificate was numbered 487, which was immediately preceded by Joseph Kirk's certificate numbered 486. Did the two men complete their paperwork together? Perhaps it's a tiny clue. Unlike Joseph, John did seek and obtained reimbursement for the three bushels of wheat he provided. Valued at sixty pounds on the certificate, the county court later determined that he was eligible for twelve shillings. However, the final Commissioner's Book enumerated a payment of 15 shillings on August 1, 1783. Although my trip to Richmond did not turn up any records confirming a relationship between Joseph Kirk of Berkeley County and my Thomas Kirk, I've certainly learned more about Virginia's efforts to supply the Revolutionary forces and Joseph Kirk's role supporting the fledgling nation. That's certainly a legacy I wouldn't mind linking to my pedigree. Good catch on the consecutive numbers on the certificates. Good luck on finding the elusive probate package. Thank you, Cathy. I feel like it means something. Now on to that probate! I agree with you and Cathy---those consecutive numbers are a potential clue. Successful road/rail trip! Deciphering an Irishman's Death: Was It Accidental? © 2013-2019 Family Sleuther. All rights reserved. Powered by Blogger.